Sakata Seed America's SunPatiens line now provide wilt resistance thanks to new genetics out of Indonesia. Better wilt resistance can mean less frequent watering in the landscape. Preciosa zinnia (Zinnia elegans F1) from Takii Seed is a new series that is early flowering, produces large, double, dahlia-like blooms, and is being launched in eight colors, including a mix. Colors include Light Yellow, Pink, Rose, Tropical Blend, and Scarlet, pictured. 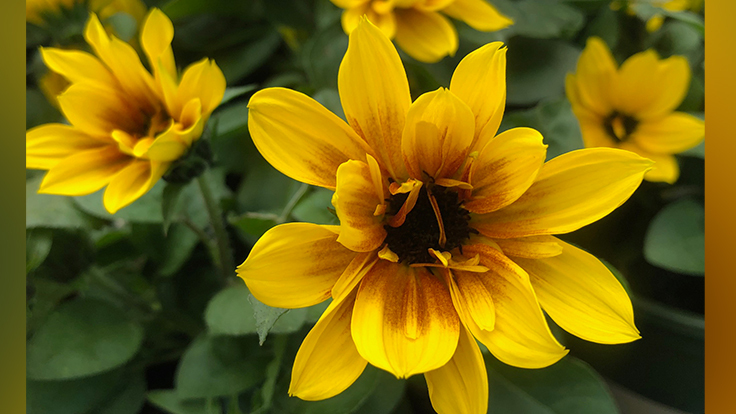 Plants grow to 10-12 inches tall with a 4-inch bloom. Preciosa also has heavier branching, uniformity in production and doesn’t need a pinch. The Heat It Up Gaillardia series from Proven Winners is among the new varieties the company is offering to expand its selection for the southern climate. The plants are vegetatively produced and are characterized by strong disease resistance, heat tolerance and a versatile habit that performs well in the container or the landscape. Hot Blooded lantana from Syngenta Flowers is sterile and doesn't stop flowering during the heat of the summer. It features a mounded habit and grows up to 24 inches tall and wide. Danziger is breathing life into Jamesbrittenia with Goldstar. It was bred with resistance to foliage diseases, it's a day-neutral crop, and it's heat tolerant. It works well in baskets and combos. One thing attendees have come to expect at Spring Trials is a "scratch-and-sniff" table from Plant Source International, which as the name suggests, displays plants with powerful fragrance. Popcorn Cassia, pictured, produces a buttery scent. Nemesia Honey Sky Blue, showcased by Cohen, is different than other compact nemesia in the Honey line because of its trailing habit that is perfect for hanging baskets. Jaldety displayed thunbergia mixes for a striking combo. Pictured: Sunny Susy Rose Sensation and Sunny Susy Halo White. The new Cats series of pansies from Benary are a result of breeding back in what most try to eliminate -- striping due to stress during production. The Spirograph effect has been stabilized and will be available in five colors once it is officially introduced in 2020, new for 2021. Heuchera LITTLE CUTIES 'Shimmer' from Terra Nova Nurseries works well in a combo, says sales manager Larry Finley. Most heucheras overpower mixes, but this one won't, says Finley, who is holding the plant here. Skyscraper Senecio from Sunset Western Garden Collection grows 5 to 6 feet tall and can add a dramatic, vertical element to mixed succulent containers. The team from Quality Cuttings had fun with Pacific Plug & Liner's Secret Garden theme, setting a table of bowls filled with succulents. Echibeckia Summerina Blazing Fire was one of the star plants at Pacific Plug & Liner, planted in containers near the entrance of their Spring Trials display and with its own vignette. Echibeckia is fast growing, good for shoulder season sales, can be grown in multiple pot sizes and is heat tolerant. American Pie 'Cherry Pie', from Pinks by Whetman, will follow in the footsteps of the top-selling 'Georgia Peach Pie' for the 2020 season. Robert Bett of PlantHaven says he's quite impressed with its foliage color and prolific bud set. As a bonus, the cherry-red flowers on strong stems work great as a cut flower for the consumer. Monrovia made a surprise exhibit at the Floracultra stop as well. To see more, click here. For more coverage from the 2019 California Spring Trials, click here. Hem Genetics placed a priority on pot mixes at pack trials. Joe Messer, manager, North America at Hem Genetics, which displayed its varieties at Speedling, wants to inspire growers and retailers to think more about mixing plants. Many customers, including Millennials, gravitate toward pot mixes, and Messer and his colleagues at Hem Genetics are encouraging the industry to be considerate of these tastes. The XDR display at Syngenta Flowers. Syngenta reimagined Imara Impatiens walleriana and Cora Catharanthus roseus for better resilience and garden performance. The acronym translates to “Extreme Disease Resistance,” but XDR is not a new variety – it’s a new program Syngenta introduced this year to showcase plants that, as the name suggests, are bred specifically to withstand common afflictions. Two series comprise what Fernandes says is a holistic approach to how you can grow and market plants, and the goal is to continue adding to the line. Imara XDR is a new Impatiens walleriana that is genetically resistant to Impatiens downy mildew and includes nine colors in its launch year. Cora XDR is a new vinca that is similar to classic Cora Catharanthus roseus but genetically different, as it’s resistant to Phytophthora. Like the Imara and Cora varieties that came before, Syngenta says the XDR varieties are low-maintenance, grower-friendly plants that hold up in shipping, perform on the shelf for retailers and in the garden for consumers. Syngenta set up inoculated varieties next to plants from the new XDR series to illustrate their disease resistance. For more coverage of the 2019 California Spring Trials, click here. A giant salvia and blossoming partnerships were some of the highlights at the breeder’s 2019 display. Hard to miss at the American Takii stop was HilverdaKooij's new gigantic interspecific salvia that can grow to about six feet tall and bloom hundreds of flowers. The Dutch breeder has not yet named it but will in Week 24 in mid-June. The mystery series comes in six colors: Violet, Cherry Red, Lavender, Pink, Purple and Dark Blue, says Floris Tas, area manager at HilverdaKooij. Rather than shipping the enormous salvia from the Netherlands to California, HilverdaKooij worked with American Takii to grow it at Takii’s Salinas, California, location. Another partnership for HilverdaKooij was on display at Spring Trials: its recent merger with Florist. The gerbera daisy breeder showcased HilverdaKooij’s plants — such as MOOODZ echinacea and Rebel dahlia — at its display at GroLink in Oxnard, California, and vice versa — HilverdaKooij promoted gerberas up in Salinas. In pot carnations, HilverdaKooij displayed its Dianthus Beauties series, which includes the single-colored Kahori and the bicolored Olivia, among other varieties, Tas says. Meanwhile, the breeder offers short carnations in Sunflor and tall selections in Odessa. The breeder is also marketing Sunflor Kaylee, known for its fragrant scent, using perfume-bottle branding. Helleborus is used a holiday crop in Europe, but HilverdaKooij reminded U.S. growers and retailers that it can flower from for several months in the United States. JWLS is an interspecific species that HilverdaKooij displayed at Spring Trials, with varieties such as Winterbells, a 2017 award-winner at Colorado State University. Proven Winners ColorChoice debuts deco planter program for retailers. For years, retailers have asked to sell Proven Winners ColorChoice shrubs in decorative pots. Beginning this year, their request has been granted. The new Decked Out program provides retailers the chance to sell high-value merchandise. Participants may plant single varieties or create combination planters. * The decorative container must cost a minimum of $2 per piece, wholesale. * The container must be designed for plants and it must have drainage holes on the bottom. * No permanent saucers are allowed. * The container must be larger than Proven Winners' true 1 gallon. Besides container requirements, the Decked Out program also has some tag specifications. * Participants must use both the standard diamond variety tag and the container tag, which contains the plant care guide. The program currently includes shrubs, but the company hopes to include perennials in the future. Retailers set their own price for the Decked Out product.